This is likely going to spread like wildfire, and it isn’t even finished yet: Information Architects has released the final beta for the fourth iteration of its awesome Web Trends Map series. This is a great visualization of current Internet trends, and how companies and individuals fit into it. The picture that’s embedded above doesn’t do it justice in any way, so be sure to check out the full-sized image hosted on Flickr. Update: better yet, head over to Zoomorama. 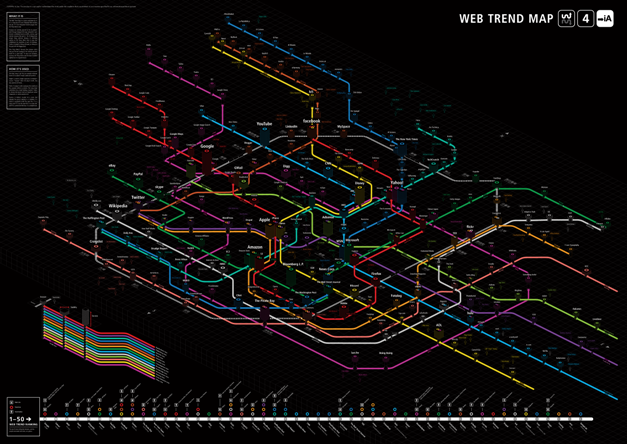 The Web Trend Map is a yearly publication by iA Inc. It maps the 333 most influential Web domains and the 111 most influential internet people onto the Tokyo Metro map. Domains are carefully selected by the iA research team through dialogue with map enthusiasts. Each domain is evaluated based on traffic, revenue, age and the company that owns it. The iA design team assigns these selected domains to individual stations on the Tokyo Metro map in ways that complement the characters of each. Oh, and in case you like it and you want to buy a printed version, they’re only making and selling 1,000 of them, so be quick.